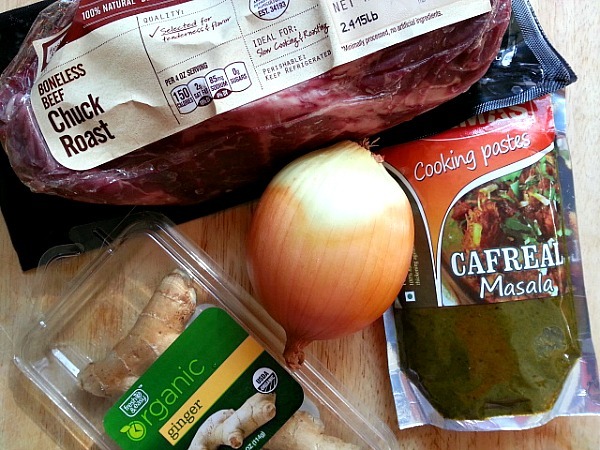 I grew up eating this beef curry recipe at least 5 days a week. Making it yesterday made me feel nostalgic and brought back a lot of childhood memories and the people who were in my life but no more. The simple pleasures of life. Beef in Goa was cheaper than chicken. Sundays we would enjoy the famous Goan sausages, chicken curry with pulao rice. That was the staple. Guess most households has a Sunday tradition but I haven’t been able to do the same with my family. Sundays is the day I don’t want to be bothered with cooking so it’s usually take out hopefully sometimes soon. Heat oil and add the chopped onions saute till translucent add the ginger and saute till you can smell it about 20-30 seconds. Next add the cafreal paste and saute for 15-20 seconds add the meat and saute for 5 minutes till all the meat is well coasted with the spices. Add water and salt to taste. Cook covered for 45 minutes on medium heat checking occasionally. Serve with rice or bread. This is such a simple recipe and like all Indian curry recipes taste better the next day. 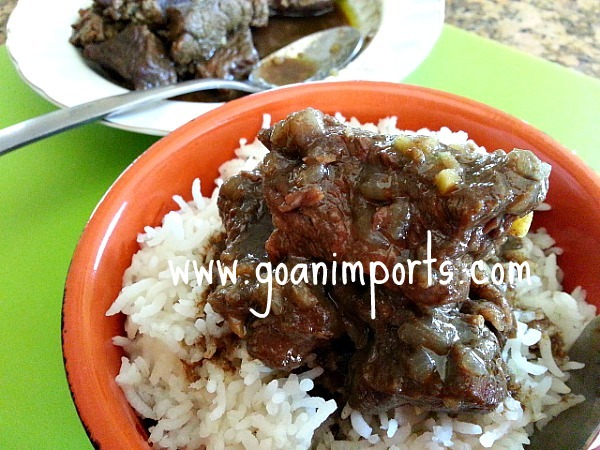 If the green beef curry is what you want to make than all you need is to add 1/2 a bunch of cilantro puree to the recipe and voila you will get the famous Goan green beef curry. 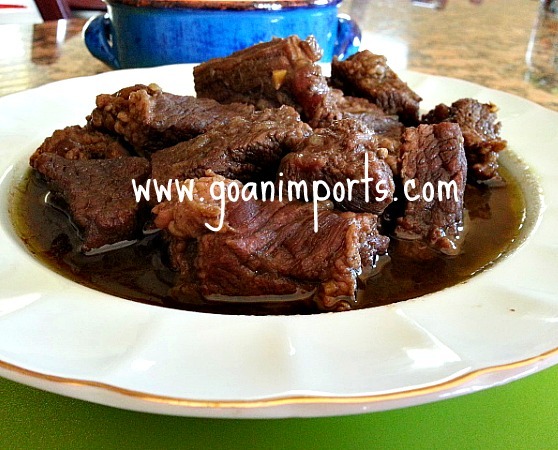 One thing about the Goan beef curry unlike the Thai beef curry there is no coconut milk and its savory then sweet. But you can always variate according to your taste. So simple and fits with my healthy diet. I love that you use cheap cuts of meat and make them lovely. My husband will be very happy I discovered these recipes. Curry is always an option. Curry is a favorite, but Americans tend to think it’s all about Scoville units and ghost chili’s. One palate at a time…. When it get´s to meat, how can I not like all these posts. It´s 1:30 p.m. and here in Spain we don´t eat until 2:30-3:30 p.m, and I´g already picturing in my head the veal chop that I´m having today with some salad to balance it out, although my guess is that I´ll end up cutting up some potatoes and frying them. Not as good looking as these plates, but it does the work for me. Thanks Charly :-). Fried potatoes and Veal Chops sound yummy. It was not only yummy, I was giggling like a little girl after eating because I was so happy. Made the day much more easier. Hi! This is super random and I don’t know if you do these, but…I hope you don’t mind that I’m nominating you for a Sunshine Award! Your recipes look awesome and I really gotta get to trying em’ out sometime in the near future! Looks delicious. My SO is Indian and makes curry. We are changing our diet a bit but will have to book mark this recipe. Perhaps he can spice up our next curry dish. It won’t be for a few more months but something to look forward to. Wow, that sounds and looks so good! Can I get your permission to post it on my blog? Thank you Candiharris. Sure you can :-). Have a great weekend.